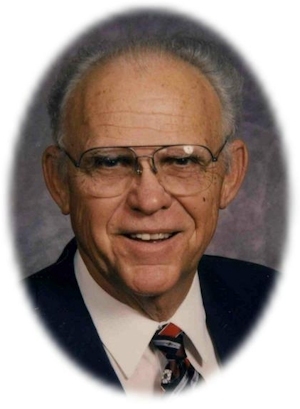 Obituary – Hall, George Washington « Perry High School Alumni Association, Inc.
George Washington Hall, 79, of Perry, Oklahoma was the son of Ora Richard and Matilda Victoria Ringler Hall. George, a third generation of the Cherokee Strip Land Run, was born February 22, 1927 in Perry, Oklahoma and died Tuesday, June 13, 2006 at The Renaissance of Stillwater in Stillwater, Oklahoma. George was baptized in the First Baptist Church of Perry on March 21, 1937. He was a 1945 graduate of Perry High School. While a PHS student, he was a High School All State Defensive Tackle in football and was recruited by both OU and Oklahoma AM to play football. 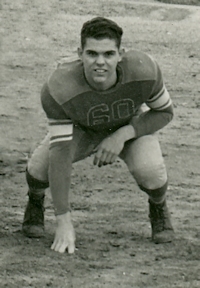 He graduated from the University of Oklahoma in 1949 with a Bachelor of Business Administration degree, where he was a proud member of Phi Kappa Si Fraternity. He later attended the Wisconsin School of Banking. George served his country in the United States Army from August, 1950 until April, 1951, he achieved the rank of Corporal before he was honorably discharged from military service. He and Juana Belle Nelson were married on May 3, 1963 in Tulsa, Oklahoma and they made their home in Perry. A life-long resident of the Perry community, George followed in the footsteps of his father who worked in banking for over 60 years. He was President, CEO and Chairman of the Board of Exchange Bank and Trust Company in Perry before he retired as Chairman Emeritus with more than 50 years of service. Active in his community, George served as a deacon and Sunday School Superintendent at the First Baptist Church of Perry. He also served on the board of directors of the Baptist Foundation of Oklahoma. He served on the board of directors and was president of the Perry Rotary Club, a Paul Harris Fellow; was a director and president of Perry Golf and Country Club, a director and president of the Perry Chamber of Commerce, served on the Perry Memorial Hospital Trust Authority and was a charter member and served on the YMCA board of directors. He was a photographer for the Perry Quarterback Club, chairman of the Cherokee Strip Parade. He was active in Boy Scouts, a member of the Oklahoma Bankers Association 50 Year Club and the American Bankers Association. George was honored as Perry’s Citizen of the Year in 1998, and later received a mayor’s citation declaring George W. Hall week in Perry. George was a life-long OU Sooner Club Booster. He loved the outdoors, was an avid golfer, quail hunter and enjoyed walking and swimming. George enjoyed OU and Perry Maroon athletics. He was a true fan of activities in which his children were involved. Funeral services will be 3:00 p.m. Thursday, June 15, 2006 at the First Baptist Church. Rev. Bobby Lee will officiate. Interment will be in Grace Hill Cemetery. Services are under the direction of Brown-Dugger Funeral Home of Perry. Memorial contributions may be made to the Judith Karman Hospice or the Alzheimer’s Association in care of Brown-Dugger Funeral Home, 1010 N. 7th Street, Perry, OK 73077. Survivors are his wife, Juana; two sons, Zack Nelson Hall and his wife, Carrie, and Charles Richard Hall and his wife, Amy, all of Perry; one daughter, Patti Vee Sheeley and her husband, Keith, of Colorado Springs, Colorado; and six grandchildren, Ashley Lyn Hall, of Stillwater, Oklahoma, Sydney Reid Hall, of Perry, Oklahoma, Riley Laine Hall, of Perry, Oklahoma, Anna Elizabeth Sheeley, of Colorado Springs, Colorado, Mason Alan Hall, of Perry, Oklahoma and Owen Richard Hall, of Perry, Oklahoma. George was preceded in death by his parents, two sisters and two brothers.